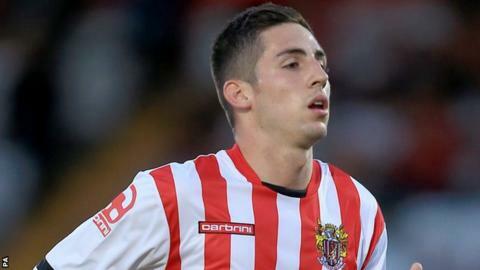 Tom Pett scored an 88th-minute equaliser for Stevenage to deny struggling Yeovil a first League Two win in nine games. Harry Cornick gave the Glovers the lead when he beat two Stevenage defenders before slotting past Chris Day. Dean Wells struck the equaliser, but Shaun Jeffers' powerful header from Matt Dolan's corner made it 2-1. Ryan Dickson's free-kick crashed against a post for Yeovil before Pett headed home Connor Ogilvie's free-kick. "We're elated with the equaliser, but frustrated because we know these are games that we should be winning. "We know there's resilience there amongst the boys because that's two or three times now that late equalisers have got us out of jail. "I felt we were too loose with the ball, too many balls going astray and too many of our boys getting caught out of position in the middle of the pitch." Match ends, Yeovil Town 2, Stevenage 2. Second Half ends, Yeovil Town 2, Stevenage 2. Attempt missed. Steven Schumacher (Stevenage) right footed shot from outside the box is just a bit too high from a direct free kick. Wes Fogden (Yeovil Town) is shown the yellow card for a bad foul. Corner, Stevenage. Conceded by Chris Weale. Attempt saved. Steven Schumacher (Stevenage) right footed shot from outside the box is saved in the centre of the goal. Brett Williams (Stevenage) wins a free kick in the attacking half. Wes Fogden (Yeovil Town) wins a free kick in the attacking half. Goal! Yeovil Town 2, Stevenage 2. Tom Pett (Stevenage) header from the centre of the box to the top left corner. Assisted by Tom Conlon. Adam Marriott (Stevenage) wins a free kick on the right wing. Ryan Dickson (Yeovil Town) hits the left post with a right footed shot from outside the box from a direct free kick. Connor Ogilvie (Stevenage) is shown the yellow card for a bad foul. Harry Cornick (Yeovil Town) wins a free kick in the attacking half. Substitution, Yeovil Town. Ryan Dickson replaces Matthew Dolan because of an injury. Substitution, Stevenage. Brett Williams replaces Dean Parrett. Delay in match Matthew Dolan (Yeovil Town) because of an injury. Attempt missed. Chris Whelpdale (Stevenage) left footed shot from outside the box is just a bit too high. Corner, Yeovil Town. Conceded by Connor Ogilvie. Substitution, Stevenage. Adam Marriott replaces Tom Conlon. Foul by Armand Gnanduillet (Stevenage). Corner, Yeovil Town. Conceded by Dean Wells. Attempt saved. Harry Cornick (Yeovil Town) right footed shot from outside the box is saved in the centre of the goal. Attempt saved. Fraser Franks (Stevenage) header from the centre of the box is saved in the centre of the goal.